Since Summer started this past 20th June, what else could be better then enjoying a bowl of strawberries!? If you’re not yet a fan, you should be. Not only are they summery, juicy and delicious, they are also nutrient-rich and packed with antioxidants. Strawberries also offer a wide range of health benefits, being wrinkle prevention one of them. Still not convinced? Then here are 10 reasons why you should add more strawberries to your daily life. According to a Toronto-based dietitian Madeleine Edwards, strawberries are an excellent source of vitamin C. Most mammals have the ability to produce vitamin C naturally, apart from Humans, which is why it is so important to incorporate them in your daily life. One serving of strawberries contains 51.5 mg of vitamin C, which means thats around half of your daily requirement. Its also a fast-working antioxidant meaning they become “workable” with our blood after eating the fruit for just a few weeks. Vitamin C is one of the antioxidants that can help prevent cancer, considering a healthy immune system is our body’s best friend. But is not all. They got another properties called ellagic acid, lutein and zeathancins which helps to suppress cancer cell growth. Vitamin C is a vital property to help our body produce collagen, which helps to improve skin’s elasticity and resilience. Since we lose collagen as we age, eating food rich in vitamin C will probably result in a healthier and younger looking skin. Strawberries also contain powerful heart boosters. According to the Heart and Stroke Foundation, heart disease is one of the leading causes of death among Canadian women. Ellagic acid and flavonoids or phytochemicals can provide an antioxidant effect that can benefit heart health in various ways. One way includes counteracting the effect of low-density lipoprotein, or LDL bad cholesterol in the blood which causes plaque to build up in arteries. They also provide anti-inflammatory effects, which is also good for the heart. Adding strawberries to the diet reduced oxidative damage, as well as blood lipids both of which play a role in heart disease and diabetes. Antioxidants and phytochemicals found in strawberries can also help reducing inflammation of the joints, that may cause arthritis and lead to several heart disease. A recent study done by the Harvard School of Public Health showed that women who ate 16 or more strawberries per week have 14% less chances to have elevated levels of C-reactive protein, which makes the inflammation. They are also rich in potassium, another healthy nutrient that will help regulate blood pressure and may even help to lower high blood pressure, acting like a buffer against the negative effects of sodium. With the impact they have on the reduction of LDL, strawberries become one of the most healthy fruits you can eat. Fibre is a necessity for healthy digestion, and strawberries naturally contain about 2 g per serving. Problems that can arise from lack of fibre include constipation and diverticulitis an inflammation of the intestines which affects approximately 50 percent of people over 60. Fibre can also aid in fighting type 2 diabetes. Sometimes, maintaining a healthy weight can be one of the hardest things to do. But don’t you fear! Strawberries are here to help. Our weight can be one of the best defenses against type 2 diabetes, not to mention it is good for you overall. They are naturally low in calories, fat-free and low in both sodium and sugar. The total amount of sugars are fairly low with 4 grams per serving and the amount of carbohydrates is equivalent to half a slice of bread. If you eat around 1.5 cups, you will have a snack with less the 100 calories! Strawberries provide Folate (B-vitamin) recommended for pregnant woman or trying to conceive. Meaning you can get around 21mcg per serving by eating strawberries. Folate is necessary in the early stages of pregnancy in order to help develop the baby’s brain, skull and spinal cord. The folic acid will also prevent certain birth defects, such as spina bifida (condition where the spine does not develop properly, leaving a gap in the spine). However, even if strawberries sound like a “miracle” fruit, you must be careful which ones to buy and where to buy. 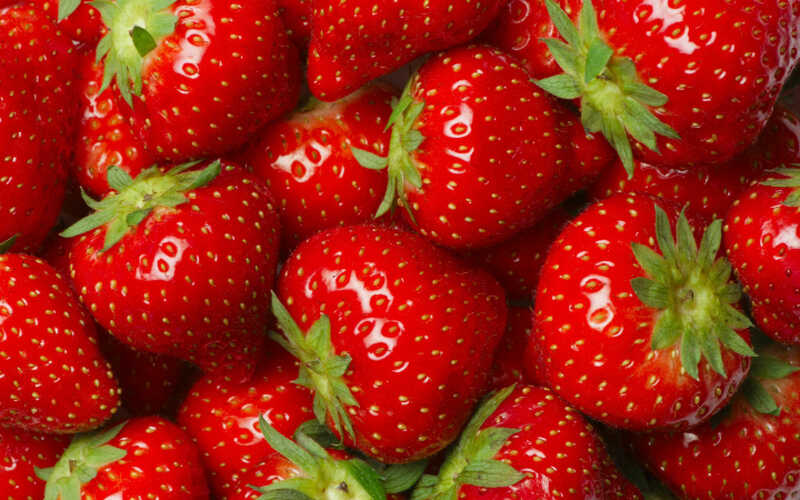 Strawberries are more likely to contain pesticides than any other type of food. Test samples in Britain showed that all strawberries selling contained traces of at least one pesticide. Reports have been found that 2.2% of the british strawberries were above the legal limit. You might want to give that punnet of strawberries a good wash before you tuck in – or better still, go organic. Have you ever tried any skincare with strawberry? Check out our Amazing White illuminating Serum which help to enhance skin elasticity with a whitening and moisturizing effect. In addition, strawberries have purifying results making the skin look fresh and smooth.